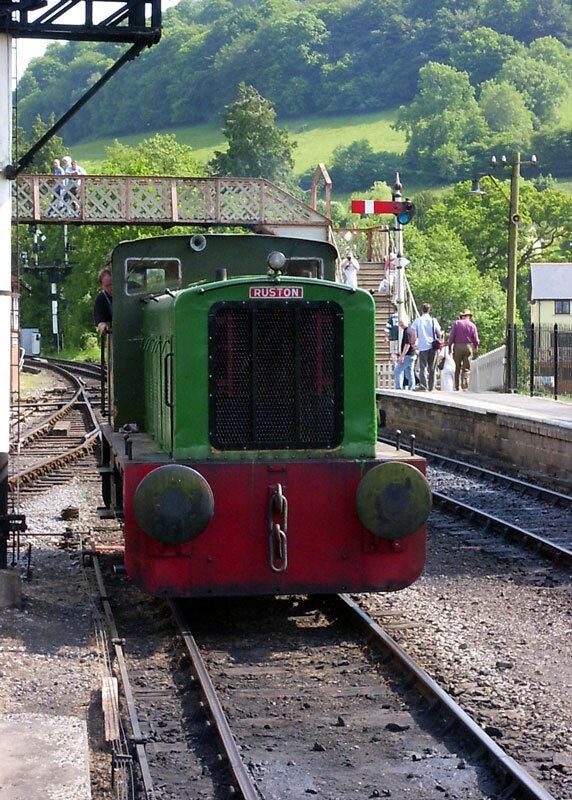 The loco worked the ballast trains at the start of March, then worked the first diesel passenger turn this year, the 16.30 to Totnes & return on Saturday 25th March. The loco had a day of shunting up the branch just before Easter to get things ready for the weekend. A steam loco broke a spring hanger on Saturday 22nd April so the loco work the last service train. A day of DMU dragging on Friday 28th April. This was for the owning groups spring visit, then on Sunday the loco took part in the Thomas event. Both 20’s had a wash & clean up the weekend before the gala. The loco worked well over the gala weekend without fault. Some more batteries on the loco have been changed due to more problems. Like 110 the loco worked the 16.30 but on the Sunday, and it had to be started via the battery charger, as yet more batteries need to be replaced. The four duff batteries were changed over the Easter weekend; only to find two more had gone! Friday 28th April saw a quick check over before the loco went up the line for shunting duties. With the batteries now holding the loco worked the Saturday of Thomas event. A sticking valve under the cab was cleaned and refitted on Sunday 30th. For the past week the loco had to run around with the DSD isolated due to this valve. A fault which comes & goes, the AWS not canceling has been traced to a lose wire on one of the reset buttons. As well as all this the loco had its brushes check over (compressor, exhauster etc) and all found in good order. The loco worked well over the gala weekend without fault and looked well with 20227 in the same livery. On Saturday 11th Feb the cylinder heads were placed back on the engine, but it was later found out that there are more seals. These went unnoticed and sit on the engine block under the cups that hold the larger transition seals, so the heads have had to be lifted off to get to these also the cylinder liners needed to be check for alignment. With this done by the end of March, the heads were (for the second time!) placed back on the engine on Sunday 2nd April and the following Sunday they were toque down to 750lb. Over Easter the coolant system was re-fitted so a water test could be done. All was fine apart for No.6 cylinder liner, which leaked. This meant that the head, piston and liner had to come off (and out) to investigate the cause. And the cause was a chunk taken out of one of the liner seals. With the seal replaced every thing was refitted and bolted down, coolant system fitted back, and a second water test was under taken this time with pressure that went over the normal working of 10-15lbs. 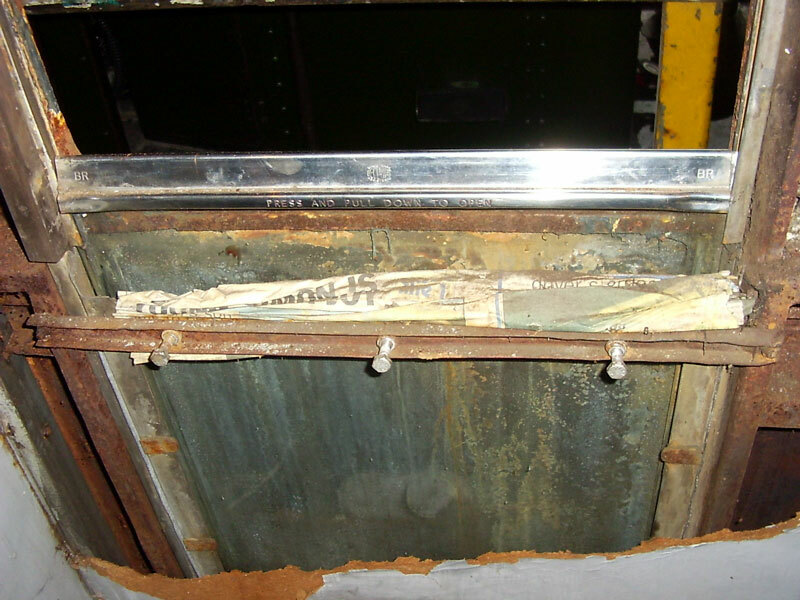 The only leaks were on three joints with no leak found on the liners or transition seals, so after this the rocker gear and injectors were placed onto the engine and all this took place over the weekend of 22nd & 23rd April. Over the next weekend (May bank holiday) the push rods were linked back to the rockers, fuel & oil pipes and exhaust system were all bolted back. The batteries had a quick check over and seem to be ok. On Saturday 13th May the engine was ready for a start up. This happened in the late afternoon and ran for about 40 minutes. Only a few electrical faults were found (one being the water pressure switch, again!) and put right. After this the engine ran half an hour at ¼ power on the Sunday. Following on from this on Tuesday 23rd it had three hours at ½ power, which went well. It now has fourteen days of light work before going back to normal workings. For this will now take us up to the end of the year! A small coolant leak on the heat exchanger cover has been found and oil is still finding its way into the exhaust system. After two days of running at the gala the power unit seems to be settling down. The exhaust has become clearer and the oil in the exhaust system has all but gone. Over the gala weekend the loco run with portable fire extinguishers, but the following weekend the three CO2 bottles were fitted back into the loco. 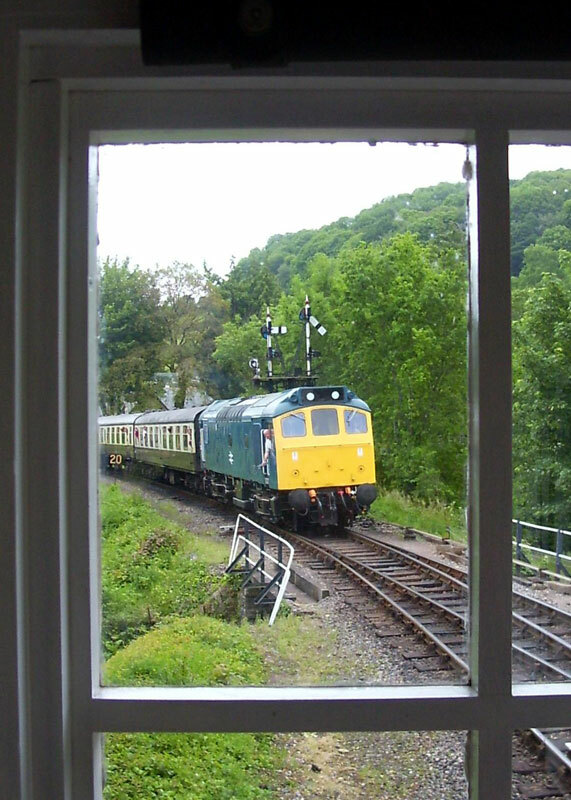 As for the gala, the loco worked well with only a couple of faults: Frstly the engine shut down on the approach to Buckfastleigh, this was soon sorted. Secondly the last trip up the line had to be done with the drivers brake valve isolated in the No.1 end due to a fractured air pipe, which has now been fixed. From mid February the No.2 cab was having the internal window surrounds and paneling removed in readiness for the cutting away of the cab metalwork and by the end of February this was almost done. On Sunday 26th Feb the engine room window were refitted with new rubber, but only on one side, the river side. The loco was shunted into the workshop at the end of March so that painting can start. And the other engine room windows were fitted. By the end of May most of the painting had been finished (apart from No.2 end!) and the bogies have had a coat of black as well. Prier to the June gala some small details were finished, like the orange line around the cab, the pipe work around the sole bar and buffer beam air pipes etc. On the Friday 9th the loco came out of the workshop and placed in the running shed on show. It was hoped to place the loco in the open, but a threat of thundery showers and the loco not having any cab windows plus the gutters missing from inside the engine room it had to stay under cover. On Sunday 26th June a start was made on dismantling the power unit. Its hoped all will be in good order, making less work than on 25901. A new set of brake blocks have been fitted to the loco. It has had a new seal fitted to the flywheel, but seems to be leaking. It was hoped to have this sorted by the gala in June, but sadly it was not to be. No change from the last time. Still waiting for it’s bottom end overhaul. Put on show at the gala with the class 04! The No.2 cab has been refurbished with a new floor and ceiling. The cab roof air vents have been blocked off so that rainwater can’t get in to root the new wood. The loco was shunted out of the P.L.O.G. shed road on Sunday 23rd April and put in the yard where it was hoped to start up the loco, but due to the failure of the lub oil priming pump motor this did not happen. The loco was booked to work the three days over the Thomas weekend of 29th, 30th April & 1st May. The pump was removed and sent away for repair. It was refitted late May, but was unable to get oil pressure. Then after priming the pump all went well, the engine started. 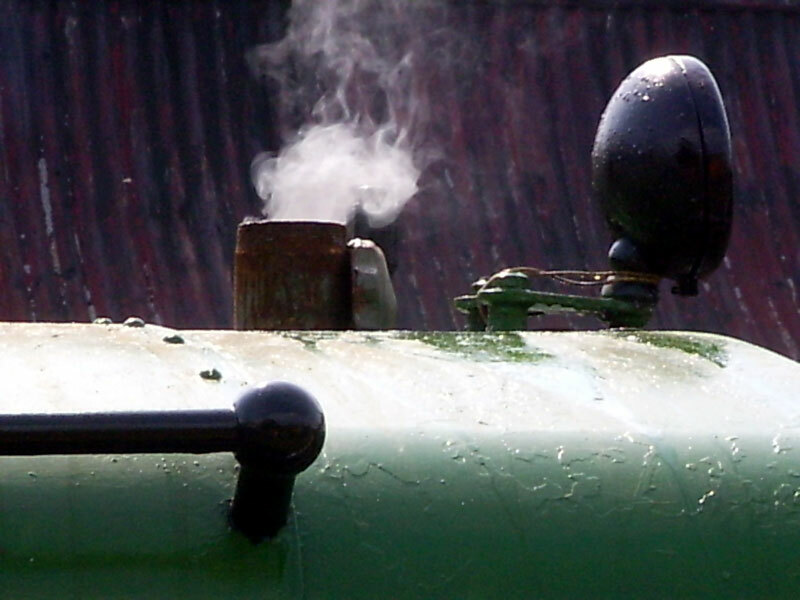 Its understood that some welding is on the cards for the loco before the winter sets in! Work continues in the large saloon with the trim around the doors & windows, also work on paneling in the Totnes end cab. The unit has started to change color from a bright green to a darker shade! With the paint just dry the unit was towed around on Friday 28th April for the annual spring get together of the owner. 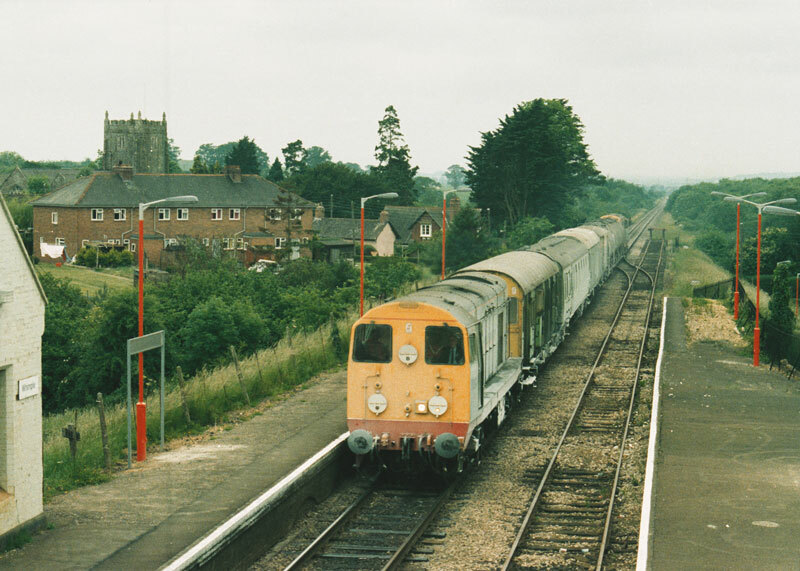 The unit was used as the second train over the June diesel gala being dragged on both days. Week commencing Monday 27th March the loco had a spin up the line, only as far as Staverton for a spot of shunting. But before the loco departed the axle boxes were found in need of oil. It is now planed to clean the axle boxes, as they were not in the best of health. Has had some repair work done to the donkey engine and oil cooler. It had the rust taken off it’s wheels on the Saturday of the gala with one or two shunts around the station, but on Sunday it would not start due to coolant getting into at least two cylinders. This points to a head gasket problem. The Visiting Locos for the Gala, a Brief History. It was hoped to have this loco, but due to air leak problems and corrosion it was unable to come. 20001 – Was new to 1D Devons Road (Bow) as D8001 on 13/7/57 (a steam era diesel!). Later moved up to Crewe South, then by the end of 1960 was back in London at Willesden. Towards the end of 1969 the loco moved to the East Midlands. In October 1971 it went North to Haymarket (Scotland) then back to the East Midlands by the start of 1973, later this year it was stored at Westhouses, then at Derby until the end of October were it went back into service around the East Midlands once more. 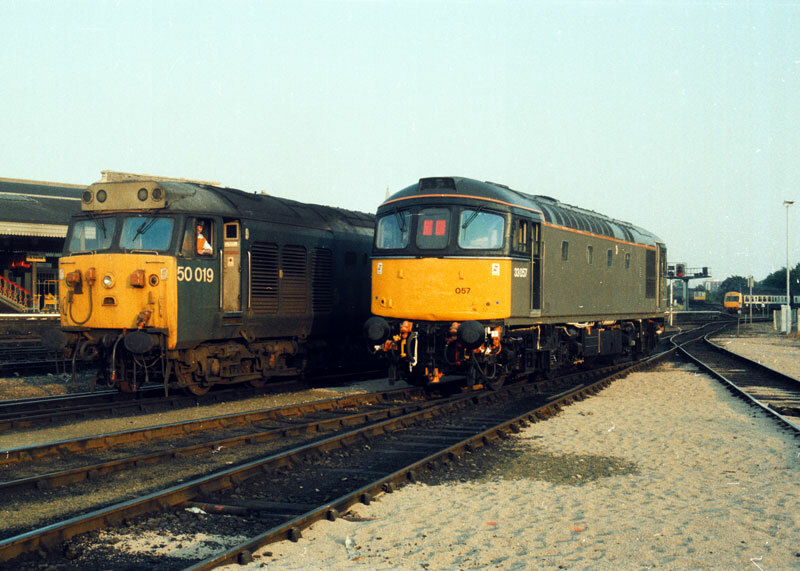 It ended its days as the Toton TMD training loco from April 1988 until withdraw in December 1988. Allocated a Departmental stock number ADB 968029, but never carried it. Loco sold to the Class 20 Society and in February 1992 the loco went to M.C. Metals, Glasgow for asbestos removal after which the loco was hired to RFS for use on the channel tunnel and ended up in France in April 1992. It was numbered 2011 and had the name “MARIANNE” before returning to the UK in May 1993 and its base at the Midland Railway Centre, Butterley. 20227 - Was new to 66A Polmadie as D8327 on 7/2/68 and worked most of its life around the Scottish depots, apart for two spells at Toton one in 1984 and the other from mid 1989 until its withdrawal on 1/10/90. 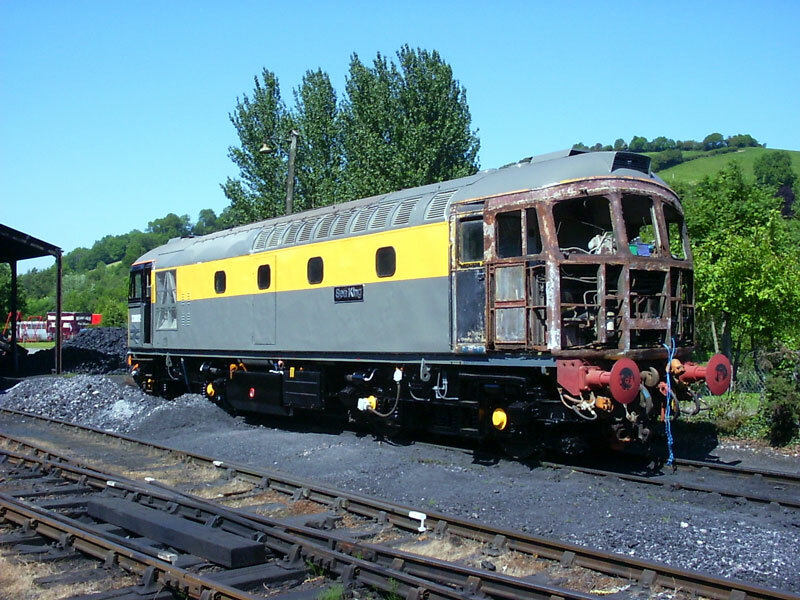 Loco sold to the Class 20 Society and to M.C. Metals, Glasgow for asbestos removal. This loco then went to MRC Butterley before being loaned to the London Underground in 1993 at West Ruislip, and then in 1994 it went over to work on the Met. It was shown at the Doncaster works open day on 9/7/94 and named “TRACTION “. It went back to work on the Met and was used on passenger workings with steam in May 2000 and was temporarily named “SIR JOHN BETJEMAN” at Amersham on 20/5/00. It then returned to its base at MRC Butterley. The loco worked well over the gala and looked good paired up with 20118. Again, it was hoped to have this loco, but due to low power problems it could not make it. 31108 - Was new to 30A Stratford (London) as D5526 on 16/4/59 after which it moved between depots between London and East Anglia until February 1982 when it went up country to Immingham, but by October it was back going between depots (London & E A) once more. It moved to the East Midlands July 1987 then over to Immingham at the start of 1990, later that year it was stored unserviceable at Frodingham, Immingham Depot and moved to Scunthorpe West yard December 1992. It was later sold to the A1A Group in March 1995 and moved to the MRC Butterley that year. 37314 - Was new to 87E Landore as D6890 on 21/1/64 and worked in South Wales until it moved to Scotland at the end of 1981 and worked around Glasgow. It was renumbered to 37314 and named “DALZELL” on 25/7/86 at Moutherwell. It went to the North East to work at the start of 1991 and was numbered back to 37190 and ended up mid 1992 working in Wales off of Cardiff until being stored 9/6/92 and moved for storage inside the closed Gateshead Depot August 1992. Withdrawn 16/7/93 and sold to the Class 40 appeal then moved to MRC Butterley. The loco worked well over the gala weekend and went well with 37321 both being in the same livery. Sunday 2nd July, Saturday 5th Aug, Saturday 2nd Sept & Sunday 1st Oct.
4 or 5 round trips – Please check timetable first! 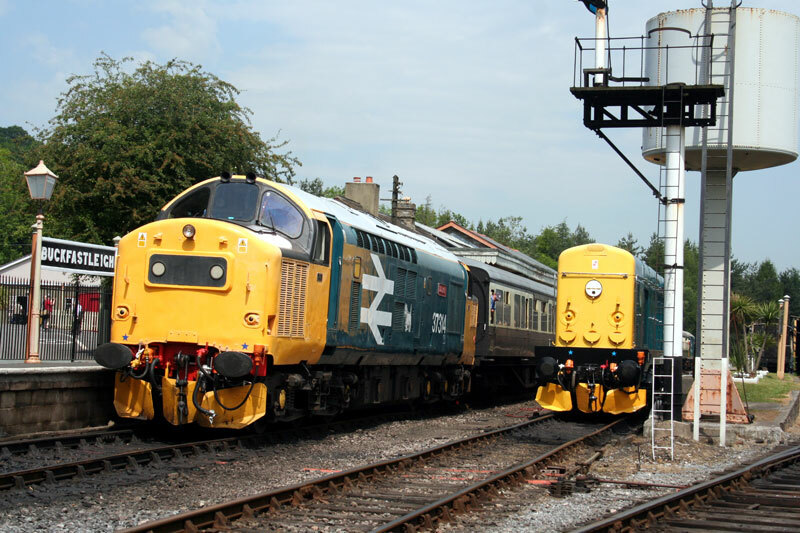 August 27th & 28th BR 50s & 60s Weekend will see one diesel turn. 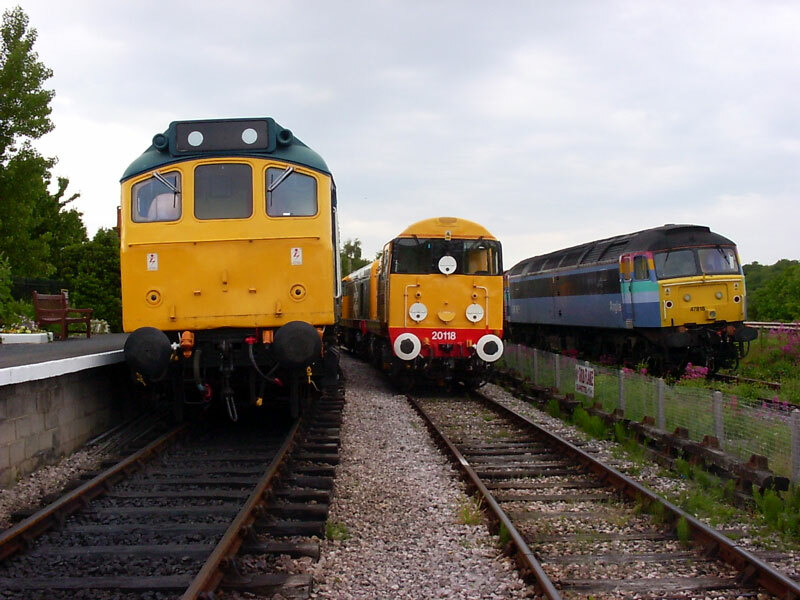 September 16th & 17th Heritage Transport Weekend may have a diesel turn in it with locos on show. Dep Totnes. Trains run from mid July to the first weekend in September, but not Saturdays. 20901 & 904 passing through Wimple en-route to Salisbury with the new weed killing train on 11-6-89. 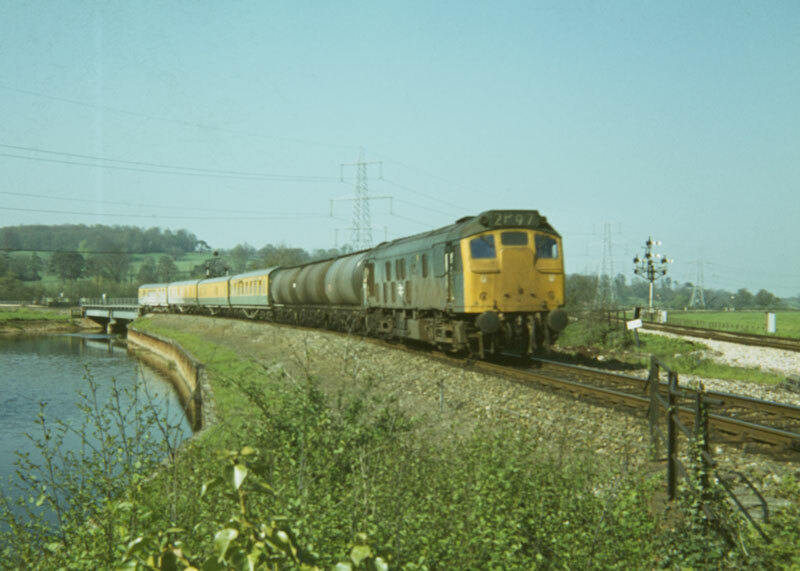 25048 coming onto the main line at Cowley Bridge Jct, Exeter with the old weed killing train on 14-6-79. 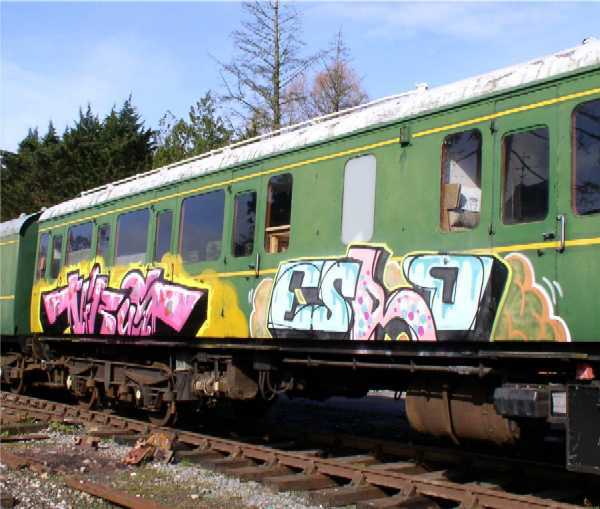 The last coach is a former DMU vehicle. Two engineers locos together, 50019 & 33057 at Exeter HS on 12-7-91. 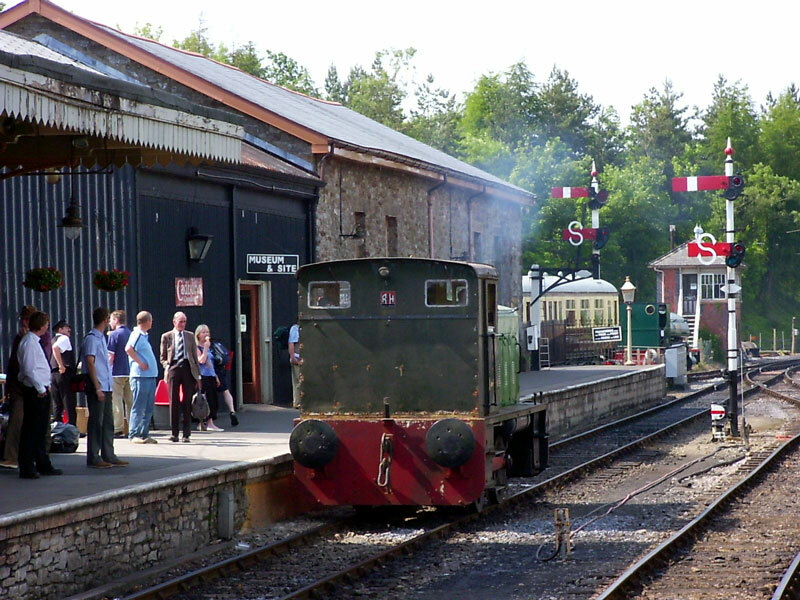 Both are now preserved, the 50, is now at the Mid Norfolk Railway at Dereham and the 33 now on the West Somerset Railway. 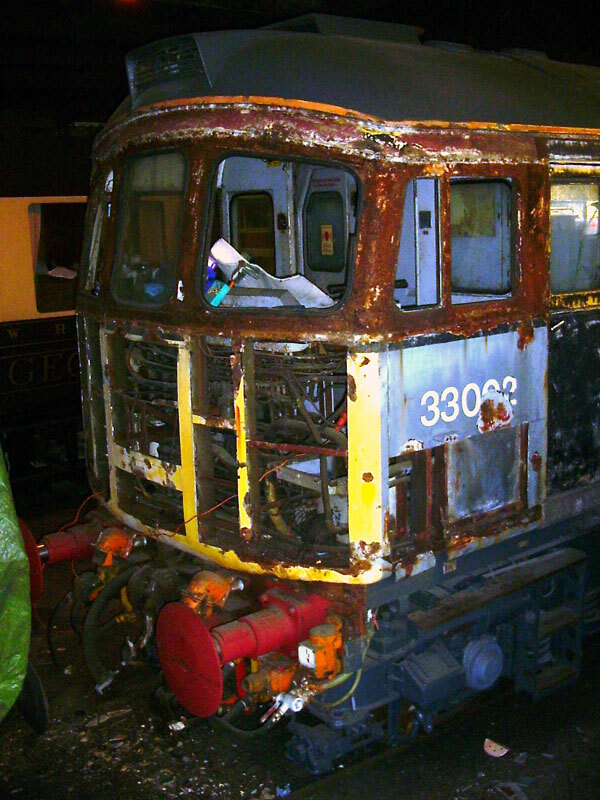 The No.2 end cab of 33002. Drivers side droplight with Southern stile draught proofing (December 1995 Railnews!) 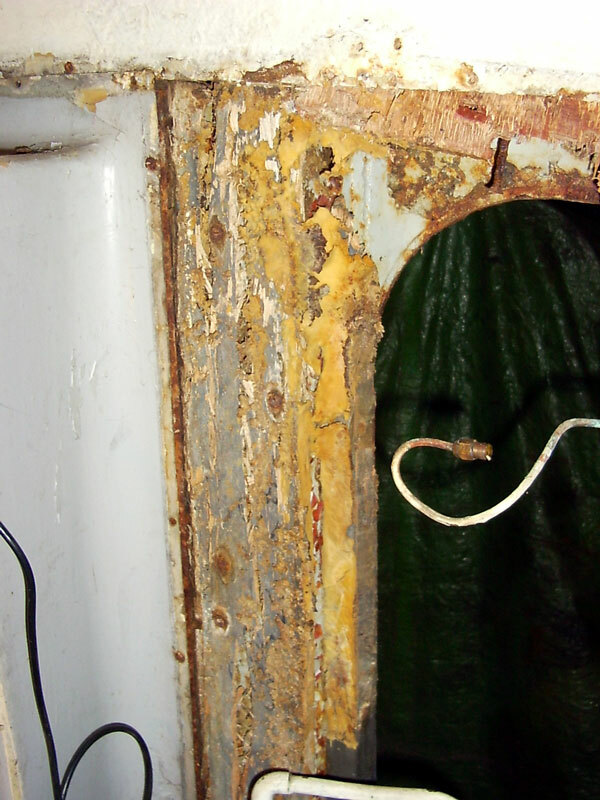 left and the secondmans windscreen showing the very rotten wood. The No.2 end with most of the old cab front cut away on Sunday 26th Feb.
A repaint for the trailer coach of the DMU, but not what the owner wanted. 37314 Waits to depart, with 20110 in the loop on the Saturday. 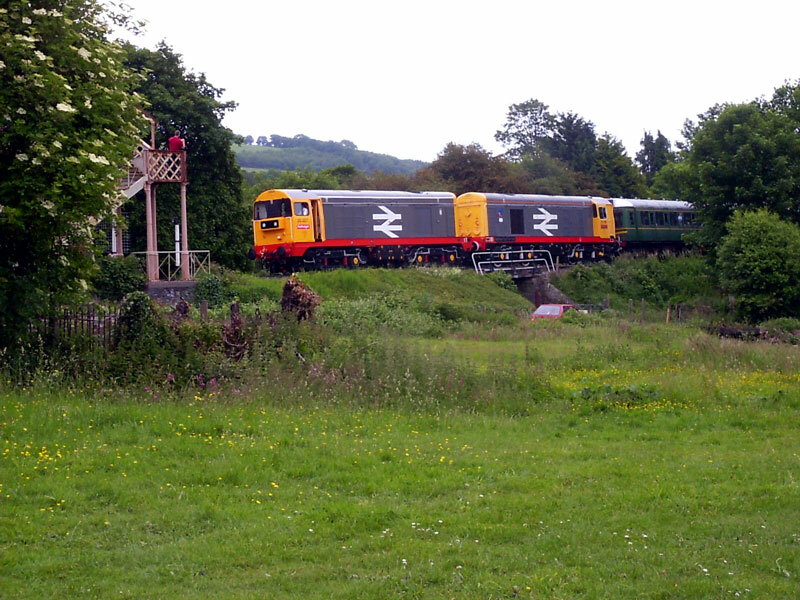 20227&118 Arriving at Buckfastleigh on the Sunday. 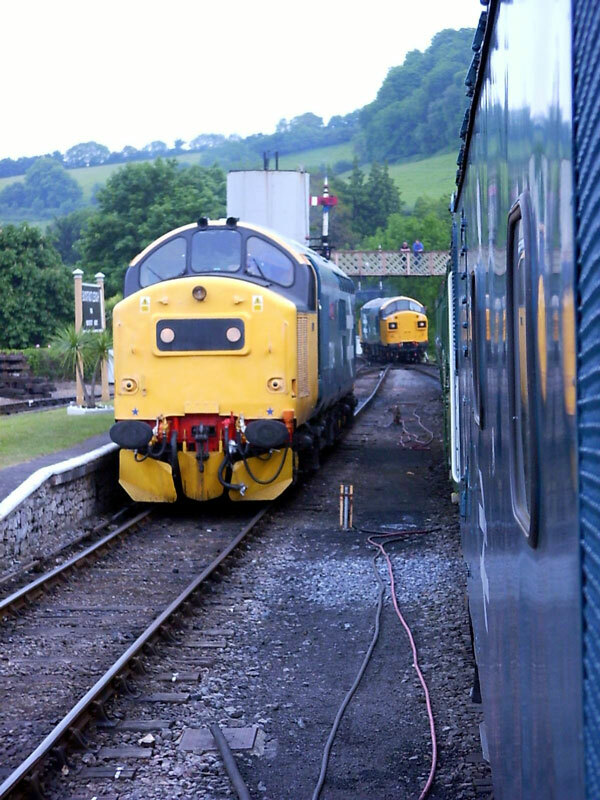 25901,20118+(227) & 47818 line up at Totnes. 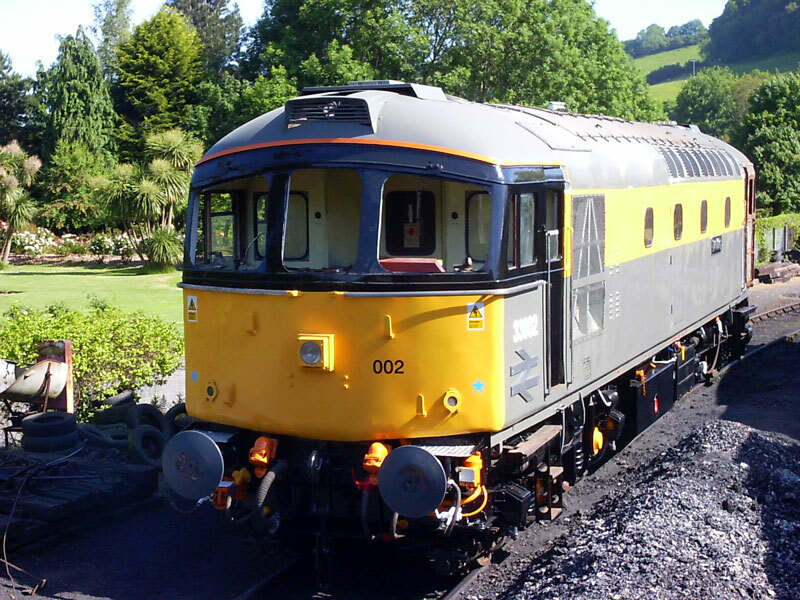 20227+118 bringing the DMU back into Buckfastleigh. 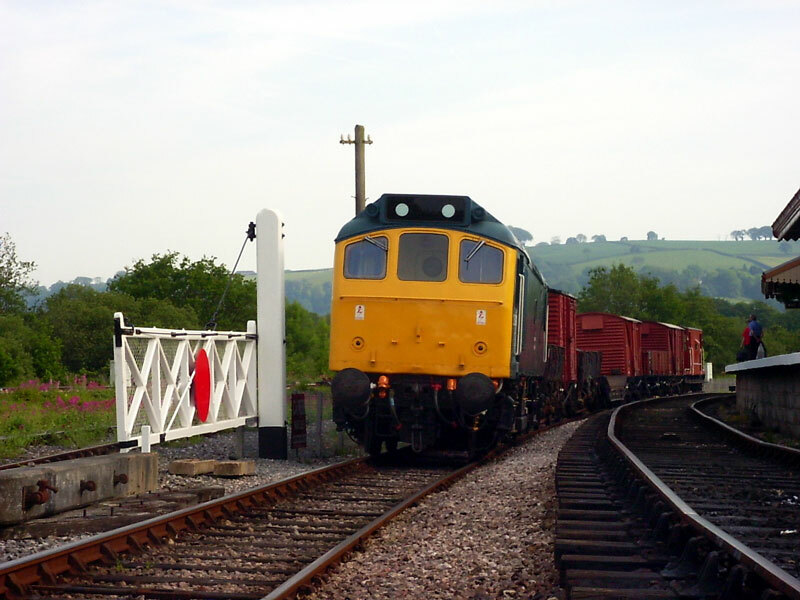 Waiting to depart with a pick up goods at Totnes. 33002 with its new body work in the sun looking Ex-works, apart for one small piece! 37314 waits it’s next train with 321 coming onto the DMU. 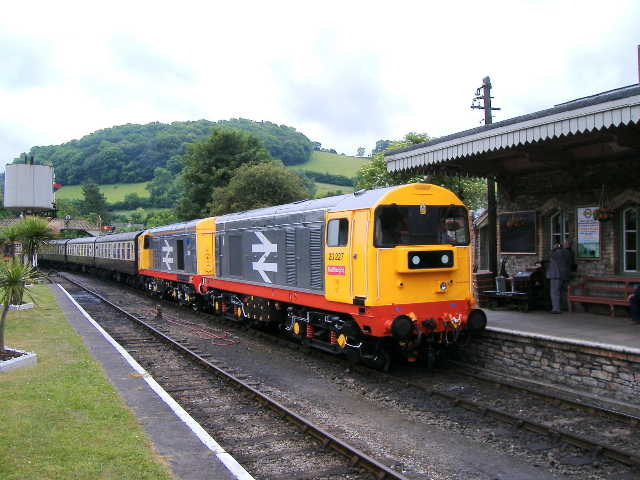 25901 arriving at Buckfastleigh. The Ruston on the move around Buckfastleigh on Saturday, the steam free day or so they think!